As we prepare for 2019, let’s take a look back at some of the top moments from this past year in our schools, in the community and around Voorhees Township. 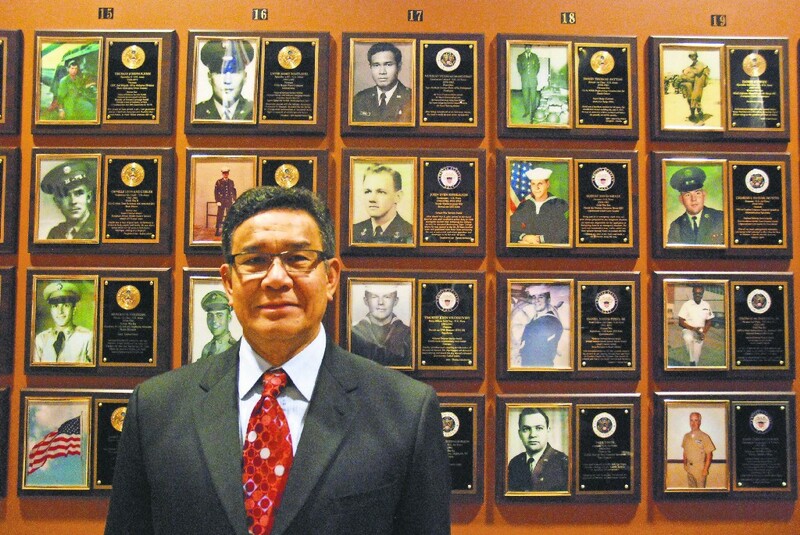 United States Air Force Veteran Murillo Mangubat stands below his newly placed plaque on the Voorhees Veterans Wall of Honor at the Voorhees Town Center. Mangubat served six years active in the Air Force. In the middle of October, Voorhees Township continued its annual tradition of honoring veterans associated with the township by inducting 16 individuals on its Wall of Honor. The Wall of Honor welcomed an inaugural 234 Voorhees veterans in its first year and has seen its number of applicants grow smaller every year, allowing for a more intimate and personal night for veterans being honored. Every year over the past five years, Jeanette Schelberg, former Voorhees Clerk, has assembled veterans and Voorhees representatives to pay their respects to those, alive and deceased, who have served their country and in some way are connected to Voorhees Township. Each plaque comes complete with a photo and details on where and when they served, along with a personal message or story, if they would like to include one. The 16 individuals who were honored on the Voorhees Veterans Wall of Honor this year include Thomas M. Bacchus Jr., Anthony Innamorato, Murillo Mangubat, Christian Stark, Charles (Butch) Taylor and Paul Yerys who all served with the United States Air Force. Those with the United States Army include Daniel Dwier, Angelo Grasso, John P. McBride and David Patton. Lastly, those who had served with the United States Navy include Robert David Gratz, John Holzer, John Kishbaugh, Lisa Taylor McManus, Timothy Miloshevsky and Daniel Joseph Pisko. Two township committee seats were available in this year’s election, with Democrats Jason Ravitz and Michelle Nocito facing reelection, opposed by Republican challengers Carmine Valentino and Ilyse Pinette. Ravitz and Nocito were reelected the committee. Nocito received about 30.66 percent of the vote while Ravitz received 27.91 percent. Meanwhile, Valentino and Pinette each received approximately 20 percent of the vote. The election sparked a debate in the township, with calls for Ravitz to resign and to drop out before the election after video and police records were released online of Ravitz in two police altercations in the past year and a half. Ravitz in a statement to The Sun before the election apologized to residents for his actions. Superintendent Raymond J. Brosel started with Voorhees Township School District as the business administrator in 1977, and remained as a constant face for parents and students in the schools over the years. Growing up in Camden, Brosel served two years of active duty in the U.S. Navy and attended Rutgers — Camden. That’s when Brosel says he came interested in education, wanting to “help young people.” He would become the district’s business administrator in that year, and later become superintendent of schools in 1986 for Voorhees. However, after 41 years, Brosel is retiring — and faculty, staff, parents and students alike have been thanking him throughout the first half of the school year, as he retires on Dec. 31. Included in the schools’ ways of thanking Brosel for his service were a Kresson Elementary School meadow being dedicated in his honor and the renaming of the Voorhees Middle School theater to the Raymond J. Brosel Jr. Performing Arts Center, as well as breakfasts at Osage and E.T. Hamilton and a presentation at Signal Hill.